We still had chicken and baguette so we repeated yesterday’s lunch. Add 10c for the arugula. Lunch today cost $2.12 per serve. 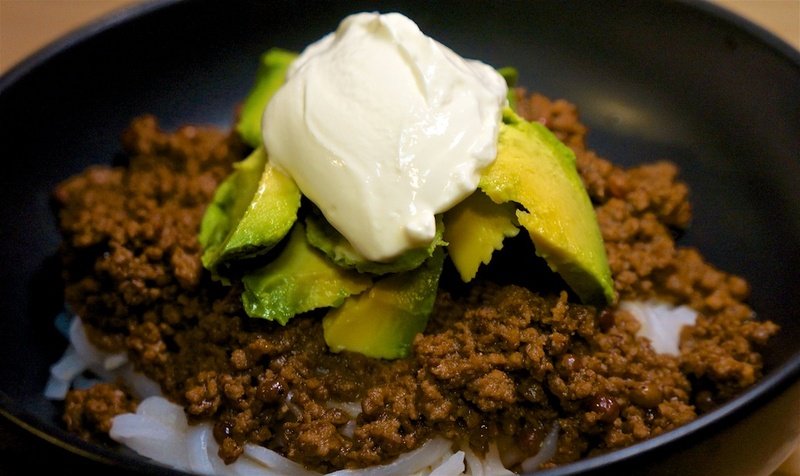 It was time to revisit the Peruvian Meat Sauce, a.k.a. Red Curry and Pink Peppercorn Meat Sauce, we had on June 18th. This time with rice noodles. 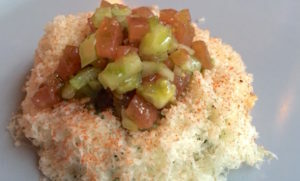 Again we found that the recipe makes for three generous serves, particularly with the side salad. 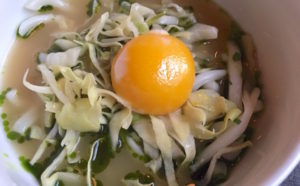 Rice noodles are $3.56 per 14oz box, we used about 1/2 of the box, or 60c per serve. Dinner tonight was, again, amazing. Definitely the best “spaghetti with meat sauce” ever, and it cost $5.70 per serve. Time for some variation so today we had a supermarket roast chicken paired with a baguette, some dried tomato and arugula. That’s a pretty good combination. Tonight was LACPUG night, so we had pizza following the meeting at Palermo’s on Vermont. Each person contributes $5.00 toward the cost of the pizza and wine. Time for a return to our typical lunch, although today we used shredded chicken breast, avocado, mango and arugula in our wraps. They would have been great if the mango had flavor! The arugula is $2.59 for the pack but we used a tiny amount, or 15c per serve. Lunch today cost $3.68 per serve. 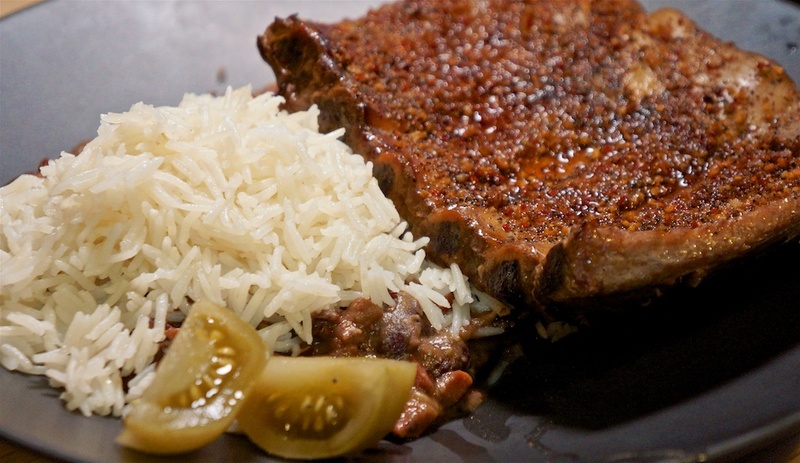 We had pork spare ribs from our Prather Ranch delivery, and paired them with home made red beans and rice. As we had the smoker and the time, we smoked the pork spare ribs. The smoked pork ribs weren’t the most tender, but they had a great smokey flavor. And the rice: 33c a serve. Dinner tonight cost $6.65 per serve. It’s nice to be home and cooking again. After all the travel, it was nice to get back to our regular routine and that means Foodie Philip’s Burbank Monday. That means an In and Out Burger, Double Double Animal Style. When we prepare the Crunchy Thai Salad, we generally have it twice in quick succession because the tuna comes in a two pack and it’s hard to buy half the vegetables. Dinner tonight cost $5.36 as it did last night. For lunch we decided to build on some Trader Joe’s Whole Grain Crispbread, which we really enjoy and is reminiscent of European grain bread. On top of that we built either a Danish Blue Castello, with sliced pear, or cream cheese, capers and smoked salmon. The pear was 70c or 35c per serve. Lunch today cost $5.19 per serve, but we’re living ‘high on the hog’ with this one. 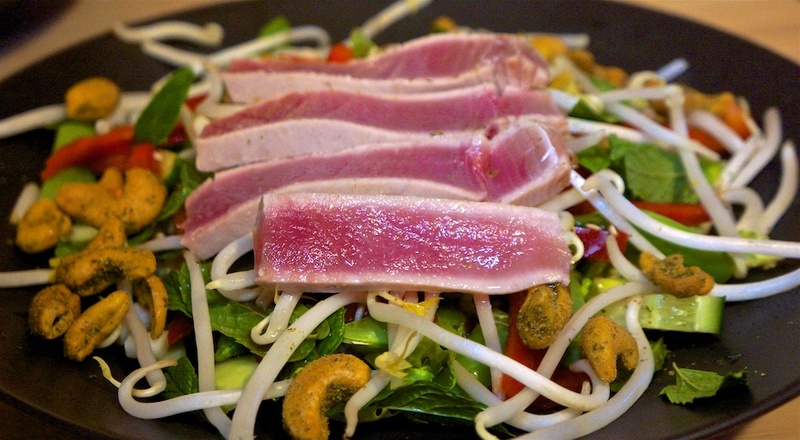 A return to a favorite: Seared Tune on Crunchy Thai Salad. We simplified a little, leaving out the bock choy and cilantro, but added Chili Lime Cashews for a little extra crunch. We added pan seared Ahi Tuna on top. We used about 1/4 of the $6.99 pack of Chili Lime Cashews, or $1.17 per serve. This is an amazing salad, and the tuna was good quality for the price. Dinner tonight cost $5.36. Up at 3am to catch a 6am flight out of Copenhagen back to Amsterdam, we had breakfast in Schippol airport: a ‘traditional English breakfast.’ That it was adequate was about the best you can say. Today’s overpriced, average quality airport food cost $12.87 per serve with coffee. A double lunch on the 10 hour flight from Amsterdam to Los Angeles included a decent coconut curried beef with rice and some other food best forgotten. The cost of the meal was included in the air fare so there was no direct cost. Back home and not feeling like cooking after a 23 hour day (up until dinner time) so we headed down to Chatsworth for a burrito from Carnitas Michoacan, which has become our go-to for Mexican. The burrito was $6.00 each. Foodie Philip was determined to try pickled herring before leaving Copenhagen and we found Restaurant Kronberg where he had a mixed herring platter: pickled, curried and fried. Foodie Greg had Danish Meatballs. The pickled herring was surprisingly mild and the three versions on the combo plate were very enjoyable. The meatballs were good meatballs. 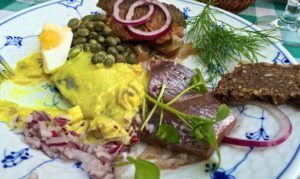 Restaurant Kronberg: Mixed herring platter: pickled, curried and fried. With a beer each lunch today cost about $24.90 each. Because the food was so amazing, we went back to Höst to sample their Signature meal, with appropriate wine pairings. The “evening with” version includes an exceptionally good sparkling white wine (French but not from Champagne), sparkling water and coffee in addition to the extra little surprises. 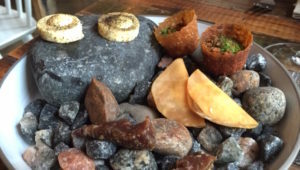 The amuse bouche, steak tartar and fluffy mushroom puffs were the same so I’ll focus on the dishes different tonight. 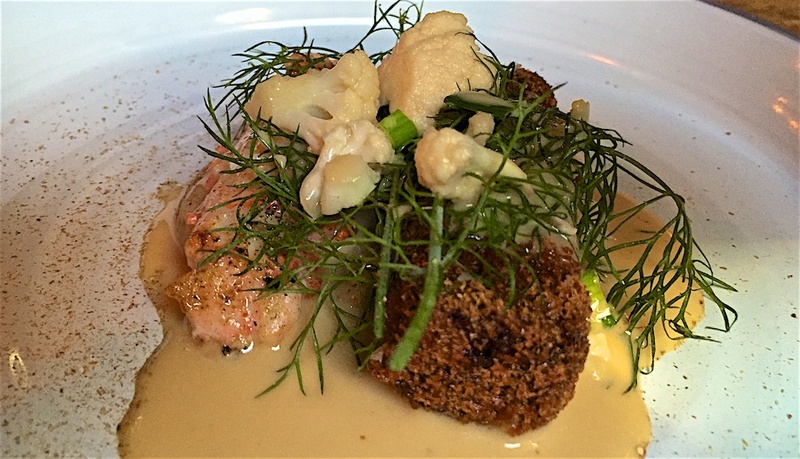 The appetizer was Norwegian lobster and veal terrine with white asparagus and cep mushrooms and is today’s featured image. Surprisingly the terrine was deep fried making it extremely unctuous. It was Foodie Philip’s hit dish of the meal. After a repeat of the exceptionally good Danish octopus with salted cabbage topped with a buttery-textured egg yolk swimming in a toasted yeast chicken broth we moved on to the main course. The egg deserves another mention because it was so amazing in both texture and taste. The main course (entree) of beef tenderloin was excellent although it doesn’t photograph well. Foodie Greg thought this was better than Tuesday’s pork belly, but Foodie Philip gave his vote to the pork! Beef tenderloin from Grambogård with salted black currant, beetroot, cress and sauce with marrow and tarragon. 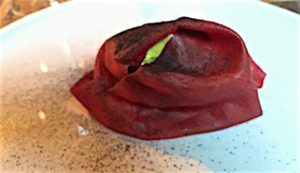 Tonight’s dessert of blueberry sorbet with brown cheese and cicely was amazing: we both gave it the thumbs up over the excellent corn ice cream of two nights earlier. 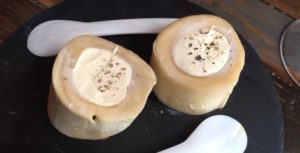 The ‘brown cheese’ is a mixture of cow and goat milk that has been heated until it caramelizes before being made into cheese, which gives it an amazing sweetness. 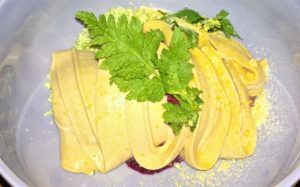 Höst: Blueberry sorbet with brown cheese and cicely. Although it looks like pasta, the texture was extremely soft. Dinner finished with the same little chocolate treat and coffee. With wine pairings and a small tip, tonight’s meal came to about $103.00 per person, but was well worth it for a meal of this quality and originality. Another consulting meeting with a client who invited us to lunch in their staff ‘cafeteria’ – a meeting room with catered lunch. The wide variety of food – from meatloaf to ceviche fish – is part of their normal lunch routine supplied by the company. We enjoyed meatloaf, a beef stew, some ceviche fish (probably herring), various salads, and more. All were very tasty and of restaurant quality, no doubt because the caterer takes special effort to ensure a good variety of high quality food to keep such a regular customer happy. Our lunch was covered by STV. Tonight we decided on something simple, so we walked over to Copenhagen Street Food, which is in a huge warehouse with about 40 food and drink vendors. 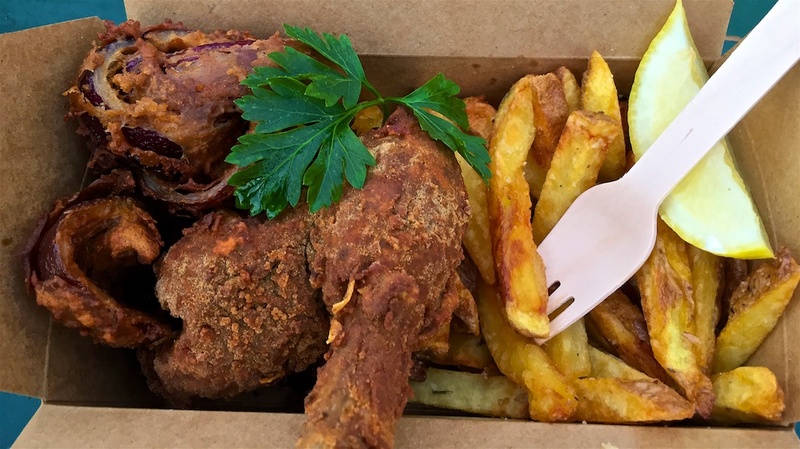 There seemed to be every type of food except traditional Danish so we settled on a French focused fried chicken, with fries cooked in duck fat! The warehouse on the river front houses abut 40 food and drink vendors. The chicken was crispy, but perhaps just a little over cooked. The fries were perfectly cooked: crisp on the outside and fluffy in the center and the duck fat did add to the flavor. There was a battered and fried red onion which was better than most onion rings we’ve had. Dinner tonight cost 100K each or about $13.00. At lunch we were meeting with a customer and recording a Lunch with Philip and Greg as well and they chose a small cafe that catered their company events. We both chose a Chicken Coconut Curry that was prepared fresh and was very good. Our customer/guests insisted on paying so it was free. After the blow out of last night we chose something simple: steak and fries (steak fritte) with Béarnaise sauce at Bøf & Ost just around the corner from where we’re staying in the heart of Copenhagen city. The steak was tender while the béarnaise was a little heavy on the tarragon. Foodie Philip is a little sensitive to the aniseed/licorice flavors but, while this was a tad more than would have been perfect, it was still a very nice sauce. The steak fries were perfect. Soft inside and a crisp exterior, salted while still freshly out of the oil. 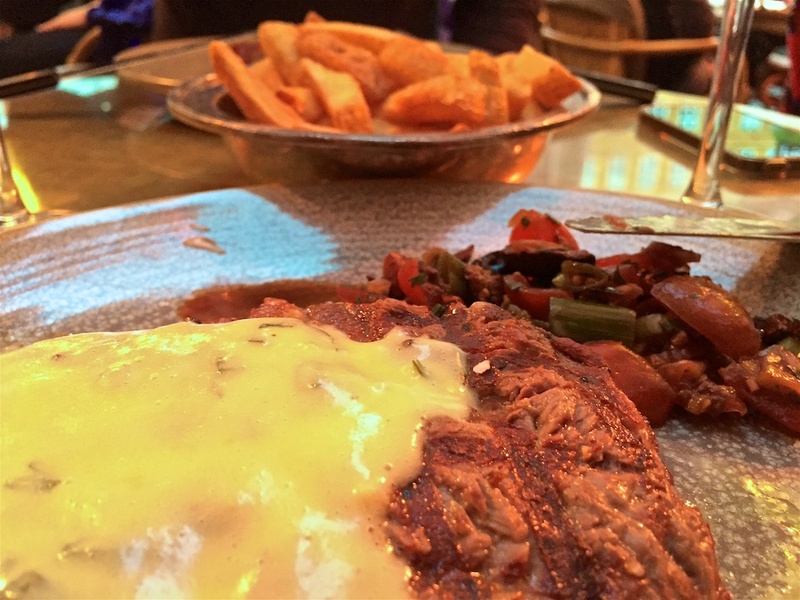 The steak and fries cost about $29.25 per serve. Our first day in Copenhagen so we went walking and exploring some of the more touristy attractions. We doubled back to Cafe Toldboden once it opened as it promised traditional Danish food. 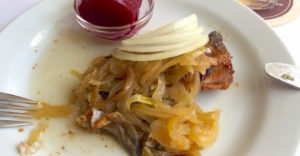 Foodie Greg had a huge plate of smoked salmon while Foodie Philip had fried herring with pickled beets and both caramelized onion and fresh onion. Both were great. Foodie Philip is working up to pickled herring. Both were served with an unleavened grain bread that was very good and reminded us of the Village bread we get from Trader Joes. Lunch was 259 Danish Krone with beer or about $9.20 per serve for the food. 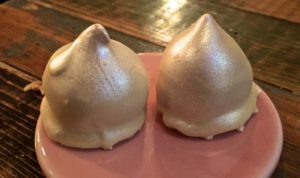 At the recommendation of our AirBnB host, we went to Höst and chose their ‘normal’ level package: three course meal with wine pairings and some surprises. Definitely not cheap, but one of the absolutely best meals we’ve ever had. Apparently we should refer to this style as New Nordic but the headline works better the way it is. It’s hard to remember every dish in details as there were so many of them, but here we go. 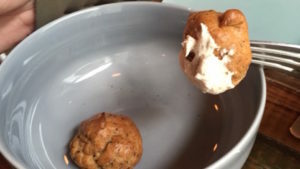 Amuse bouche: At the top, on the rock is a soft cheese with oyster cream. Bottom left, malt and tarragon cured beef. The turnover is made of picked celeriac and filled with a crab puree, while the crisp potato cup was filled with creamy potato puree and topped with chives. All were delicious! A second non-course followed. The combination was reminiscent of a favorite: Filet Americaine. Bone filled with a steak tartar topped with creme fraiche. And yet another little surprise. Amazingly fluffy mushroom puffs that kept morphing flavor as they were consumed. Next up, bread and butter. It’s odd to think that this was once just ‘bread and butter’ before industrialized food production took over. 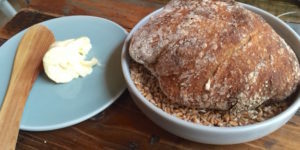 Höst churned butter and Höst made sourdough bread. A perfect crust and crumb. Now to the appetizer! The flounder was perfectly seared on one side and buttery soft on the other. The greens were amazing, possibly even better than the flounder. 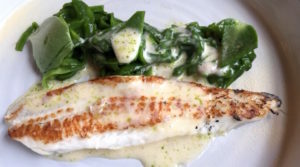 A perfectly cooked filet of flounder with kohl rabi, spinach sitting on a parsley puree with an oyster sauce. Before we got to the main course, there was another surprise! 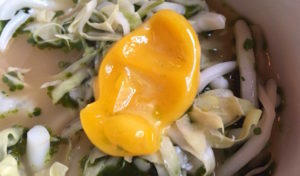 Danish octopus with salted cabbage topped with a buttery-textured egg yolk swimming in a toasted yeast chicken broth. This combination was both surprising and delicious. The egg yolk had been sous vide to the texture of soft butter, or a very heavy cream. The egg yolk was probably the most ‘eggy’ thing we’ve ever tasted. Finally to the amazing main course. We chose this menu because the main dish was pork belly. Pork belly with tomato, cress and sauce chyron topped with little pillows of Danish cheese. Every component of this dish perfectly complemented the others. The pork belly was so tender it melted into the dish. We had a small break before dessert. The Foodies don’t normally eat dessert but exceptions should be made for food this good. 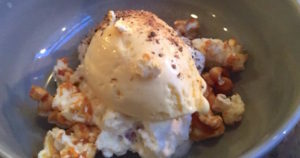 Corn ice cream, fresh raspberries, caramelized popcorn and goat mild yoghurt with chanterelles. Corn ice cream? Oh, yes, definitely. Give us more! Coffee was complemented by mousse filled chocolate truffle. Host: Just one more bite! Marshmallow bottom with a mousse filling coated in white chocolate. Of course, the wine pairings – from the sparkling white to begin, to the chablis with the appetizer, Rosso di Montepluciano with the main, and Moscato d´Asti with dessert – were a perfect match at each stage of the meal. With a small tip – not normal in Denmark – this amazing meal was about $83.85 per serve. Definitely not cheap, but absolutely worth it for this meal. This includes the wine pairing which has a separate value of about $25. We’re booked to go back and try the Signature Dinner on Friday before we leave Copenhagen.